The building continues! I planed down a few more boards and we drew up some plans to make matching benches for the table — actually it was more of a sketch, a working prototype, and a couple of miscut boards, but once we got it down, the remaining three followed pretty easily. 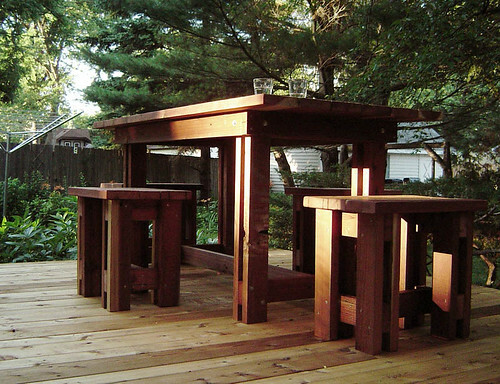 The darker color is a result of the waterproofing that we applied to both the table and chairs (and to the deck, of course… which, by the way, Barb, is cedar). I could get into this woodworking stuff, but given that half the year is spent indoors (fighting off the cold of winter), it probably makes sense to continue working with wool. However, the stack of old redwood boards is pretty big, so until the weather turns, I’ll stay focused on recycling the wood… next up, perhaps a couple of adirondack chairs for the patio? Virgina finished another pair of socks. 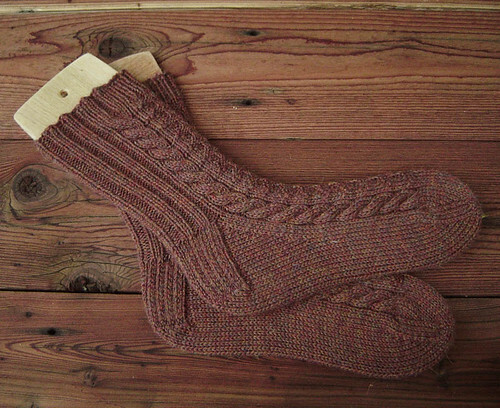 These are from Nancy Bush’s “Knitting on the Road.” The pattern is Whitby, and she used Berroco’s Ultra Alpaca Fine, which is one of their new yarns. The doubled-up yarn knit on size 2.5 needles makes for a very soft, but firm, fabric. We’ve got to keep thinking about the cold, even when it’s 90º outside. Wow! I’m really impressed by this project! And the furniture is really nice too:-D and the colour: beautiful! I love the new socks – that is a fun pattern. I made some last year around this time.